AiPT! staff reflects on Boston Comic Con 2017 – AiPT! 4 members of the AiPT! staff attended Boston Comic Con 2017 – here are their thoughts. Boston Comic Con 2017 has come and gone, but boy did we have fun reporting on the event. Four members of the AiPT! staff attended the convention, covering panels, conducting interviews, and snapping some great cosplay. The event as a whole was a real treat. It was also at a new venue, which was larger and in a lot of ways an improvement. After attending Boston Comic Con for years–and attending other conventions like NYCC and SDCC–we have plenty of thoughts and feelings about the event in general. Here are our Boston Comic Con 2017 reflections! 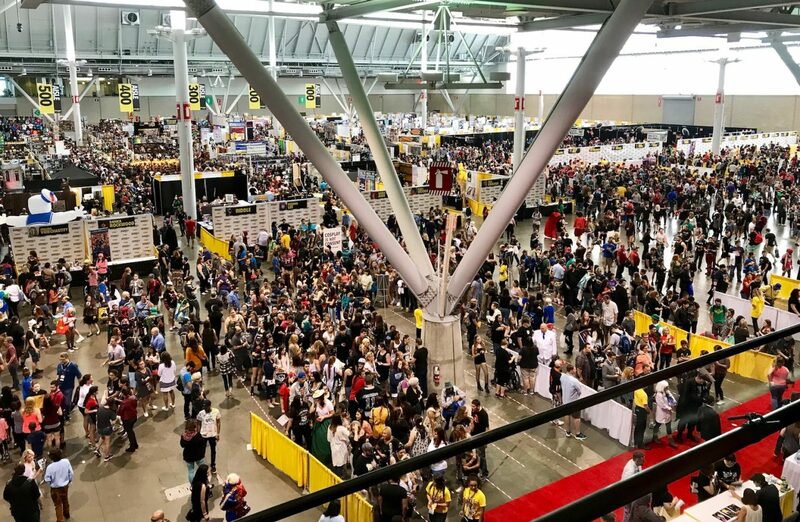 David: What a delight Boston Comic Con 2017 was, especially compared to the smaller space of previous years. After attending San Diego Comic-Con 2017, I have to say BCC is raising its game and I can’t wait to attend next year and the years after. Not only is the larger space better (with so much natural light flowing in), but it’s also cooler. You’re never uncomfortably hot like it can get at SDCC and it’s much cooler than in the previous venue. The biggest surprise, though, has to be the Artist Alley. It was so big! Artists seem to have had much more space than at other conventions and the ease to move around was quite nice. There was also a lot of big-name comic book artists and writers, which rivals other conventions I’ve been to. I did think panels could be more interesting, especially when conducting a convention in a college town like Boston. More panels with teachers and psychologists on topics and themes like I saw at SDCC 2017 could have brought the event to another level. Chris and David at Boston Comic Con 2017. Chris: This was my first time going to a convention for more than one day. I’ve always been able to see everything I cared about within a few hours. After attending Boston Comic Con’s first night, however, I was pumped to return the next day. The venue was just so big! There were areas I discovered toward the end of day two I had no idea existed on day one. At the Seaport World Trade Center, people waited in lines that wrapped around the building forever. At the Convention Center, there wasn’t much of a wait at all – and the security checks were speedy while still making me feel safe. My top Con con (Ha!) would have to be the Saturday crowds, which got to be a bit unbearable at times – especially when I just wanted to grab a quick bite and ended up waiting longer than I wanted for two slices of pizza. With that said, the pros far outweighed the minor inconveniences. I got to sit a few rows away from Stan Lee for an hour while he whipped out joke after joke. I got to talk about Mister Miracle with writer Tom King. And the chicken tenders I ate at the end of day one were so tasty! Yes, I just listed chicken tenders alongside the chance to see the father of Marvel Comics and talk to the writer of the critically acclaimed Vision series. But, if those two had these chicken tenders at the end of a long day, they’d probably be cool with it. JJ: I don’t know about the rest of you, but when I’m having a blast, time seems to fly. When I’m bored and disinterested, time will drag. Boston Comic Con went by in what felt like the blink of an eye. Suddenly, it’s Sunday evening and I’m wondering where all the time went. As I was leaving the convention center Sunday, I realized there was an entire section of booths I spent no time at. I’m fairly certain that’s never happened to me at BCC before. It seems the individuals in charge of organizing BCC have really stepped up their game. The first and most obvious improvement was the change in venue. While the Seaport World Trade Center is a nice enough building, it’s simply too small to accommodate what BCC has grown into. My memories of last year consist of being claustrophobic, anxious, frustrated at the lack of food options and HOT. The move to the Boston Convention Center is a welcome one, as it has more than enough space to house the convention, it’s air conditioned and has a great selection of food, including vegetarian-friendly options. David and JJ at Boston Comic Con 2017. Several cons have recently received criticism from the comic writer/artist community for a lack of focus on the foundation that comic conventions were built upon–comic creators. Several of the large cons have grown into gigantic media events that focus heavily on trailer releases and big-name celebrities. While there’s nothing inherently wrong with growth and expansion, unintended consequences can often occur–such as comic creators being given significantly less consideration in regard to space and exposure. I don’t foresee this being a complete issue for BCC. Artist Alley was huge! I loved how much space I had to walk around and take in all the impressive work featured there. There was never a moment where I felt crowded and frustrated due to being unable to reach a table. My favorite part of BCC this year was the focus on cosplay. I can’t remember there ever being so many stars of the cosplay community in attendance; LeeAnna Vamp, Danica Rockwood, Jessica Nigri, Soni Aralynn, Jennifer Van Damsel, Monika Lee, the list goes on. In addition to the big name cosplayers, the community came out in strength. Holy crap, I’ve never seen such a large gathering of talented cosplayers before. I got over 150 photographs to prove it. The one thing I’d like to see a little more attention to is security. Day one and two, I was processed by a very professional, efficient and thorough security check team. Day three didn’t lack any of the professionalism from the team, but no one took a look in my bag or had a dog inspect it. My hope is this was one of very few such mistakes. Overall BCC has improved by leaps and bounds since last year. The venue is vastly superior, there’s a clear and strong focus on comics and their creators, the cosplay presence was outstanding, there was piles of fun things to spend your money on and a great line-up of celebrity guests. Pat: I’ll be honest, Boston Comic Con has been less than impressive to me in years past. The convention center it was held at in previous years was cramped, it was small, and it was hot. The move to the Boston Convention Center was the best thing they could have done, and overall, the convention felt like it was being taken much more seriously by management. The presentation this year took it from a con that almost felt like an also-ran to being right up there with the best in the country. As Dave said, Artist Alley was quite impressive. There was so much to see, but ample space to wander around and really enjoy yourself. All the panels I attended, with few exceptions, were timely and the guests seemed excited to be there in front of their fans. As a huge wrestling nerd, I was disappointed at the lack of representation for my favorite fandom, but maybe next year. Those are our thoughts–feel free to share your own Boston Comic Con 2017 reflections in the comment space below!